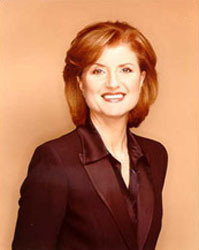 Arianna Huffington is a columnist, web publisher, and frequent presence on TV talking head shows. She wrote several non-fiction and non-political books in the 1980s and 1990s, and first came to moderate fame as the strong, somewhat domineering wife of 1994 Republican candidate for Senate in California, Michael Huffington, heir to oil magnate Roy M. Huffington's fortune. Her husband was defeated by Democrat Dianne Feinstein, and after the election he divorced her and publicly announced himself to be gay. He has said that his ex-wife knew of his interest in men before they were married. The former Mrs Huffington went to work for Republican icon Newt Gingrich, and wrote a conservative newspaper column that was syndicated, but with minimal success. Readers and editors were perplexed when, instead of being utterly predictable in her views, Huffington's columns began inching bit-by-bit to the left. By the turn of the millennium, she had reinvented herself as a liberal columnist. Huffington has taken vicious but well-deserved jabs at Rush Limbaugh and George W. Bush, but also described the Democratic Party's leadership as being "in complete denial". She supports medical marijuana, hardly a controversial stand in California. She has criticized then-Florida Governor Jeb Bush for pulling strings to ensure that his drug-addled daughter Noelle Bush sidestepped all the normal legal penalties for her crimes. She calls for programs that genuinely support the troops, from increased medical benefits to mental health counseling for returning war vets. She wants America to abide by the Geneva Conventions, and has called for the closing of Guantanamo and other extralegal U.S.-operated prisons. In 2003 Huffington ran for Governor of California as an independent, finishing far in the distance behind Arnold Schwarzenegger. In the same year, she put together a series of TV and print ads that parodied the White House's "drug war" ads, which had claimed that smoking pot was supporting terrorism. In Huffington's ads, she argued that SUV sales and the oceans of fuel needed to keep those vehicles rolling, funneled much more money to terrorist governments than any pot purchases. In 2005 she founded The Huffington Post, a website built around un-paid amateur bloggers, featuring news republished or summarized from traditional media coverage and celebrity columnists. The site has proven increasingly popular with a liberal-leaning audience, and in 2008 Huffington Post hired a small staff of paid investigative reporters, though most of the site's content remains the work of volunteers. In 2011 she sold the Huffington Post to AOL, where she emerged as editor in chief of AOL's entire stable of news-oriented websites. In her new position, Huffington ordered mass layoffs at AOL within weeks, and added right-wing pundit Andrew Breitbart as a columnist at the previously left-leaning Huffington Post. Describes herself as an independent, unaligned with either party.